The Daily Press, local paper for Hampton Roads featured Felix the Comet in their entertainment section this week! Click on the title of the newspaper to see the local authors feature in Leah Price’s column online. I’m still fond of reading actual newspapers, the feel of the pages, the inky newsprint smell, the sound of the pages when I flap them into shape. I didn’t even have to do that yesterday, as my name was on the top of the front page of the Entertainment section! May is great timing to order a paperback copy for summer reading from Lulu.com or any ereader app you prefer by visiting the links in my right margin or below if you are viewing via mobile device, or look for Felix the Comet in your preteen’s ereader! If you are a teacher or administrator for an elementary or middle school and would like me to visit, please feel free to contact me via the comments section for next school year. Lisa Damian and I got to know each other when our kids were babies through another blog Studio Mothers. That blog was a great place for me to re-enter writing seriously after my move to Virginia and having my third child. She regularly reviews YA books at her blog, Damian Daily. 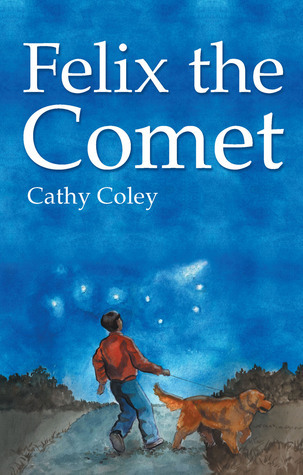 Lisa recently read and reviewed Felix the Comet, having watched the book and my kids grow up between Studio Mothers and my prior blog, Musings in Mayhem, which was more about balancing writing, family, and special needs. Even saying that, I think her review is fair and honest, and I appreciate what stood out in her reading of it. It is a lovely review, go check it out at Damian Daily! Check out some of her other reviews while you are there! She has a couple of books of her own, too. Please share, too, I really would like to see this little labor of love about dealing with being bullied to be read by as many fourth to sixth graders as possible. It’s fun, too! Dark Cloud usually blogs about Games and Gaming, a lot of the Table Top variety. You should check him out, he always has good suggestions. Felix the Comet is gaining some reviews at the publishing site (click on pics in sidebar for paperback and eBook versions) It could use a little help over on Amazon for Kindle If you’ve read it, I would appreciate anything you have to say about it in any of the three places. My little book just garnered a review in a long standing YA reviewer’s blog! I appreciate Paul Goldschmidt’s honest assessment, and know that if he really disliked it, he would have been honest about that, too. Please go to his blog, Not Acting My Age. Thanks for taking a peek at his review, and please pass on the word about Felix the Comet. Oops, Did I forget to mention?